1. Ascent type - winter. 2. Region - Tien Shan , Kirghiz ridge. 3. Peak - Free Korea 4740m., along the left part of the Northern wall. 4. 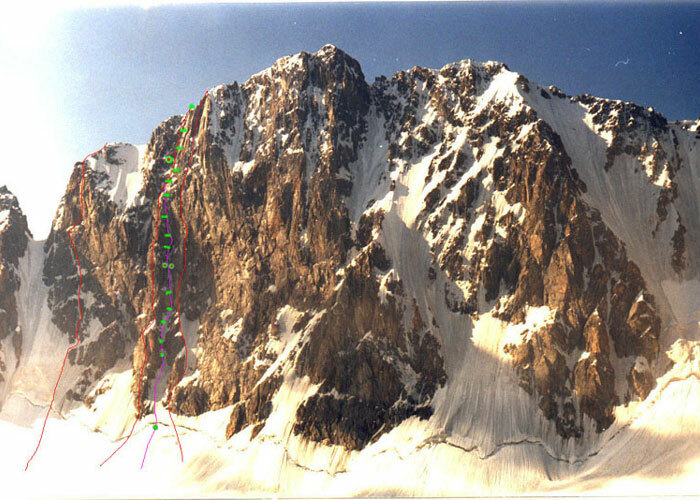 Supposed - 6 А grade, first ascent. 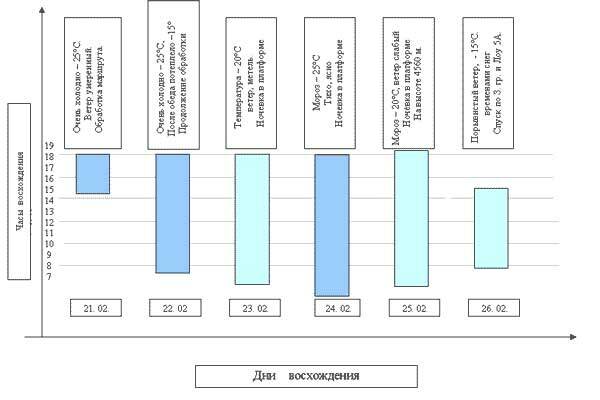 ( ФАиС of Russia sentenced the route to5 Б grade. The route is situated between two routes, which have not yet been repeated: Shvab а 82. (5 Б ) and Студенина (Studenina) 66. (6 А )). 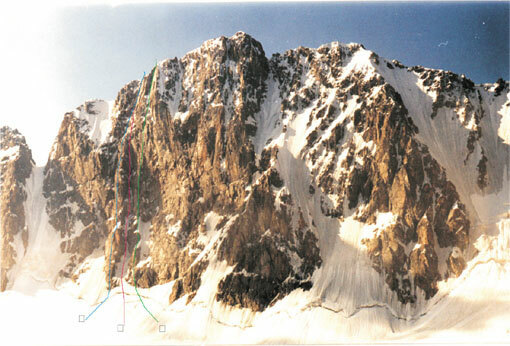 The route achieved II place in Russian Winter Championship 2000. Height: till the ridge-530m. till the summit – 650m. length of 6 grade sections - 300 m., 5 grade – 380m. 7. Working hours - 49, Days - 6. 8. Nights - 3, +1 on descent. All the nights on ascent were in platform. Start of the route – February 21, 2000. 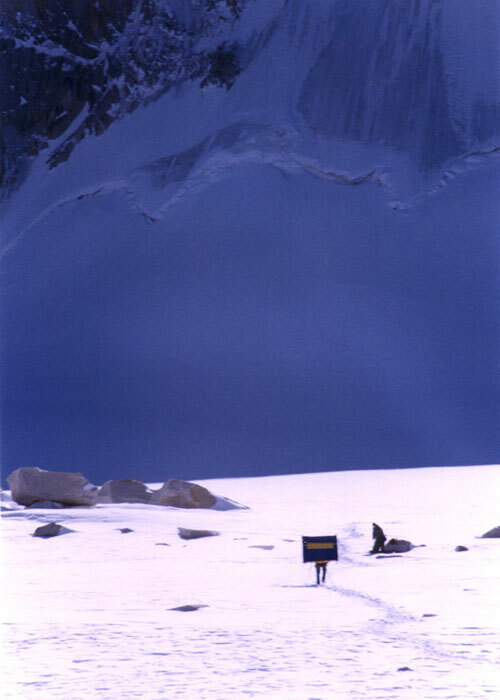 Summit -- February 26, 2000. Return - February 27, 2000. 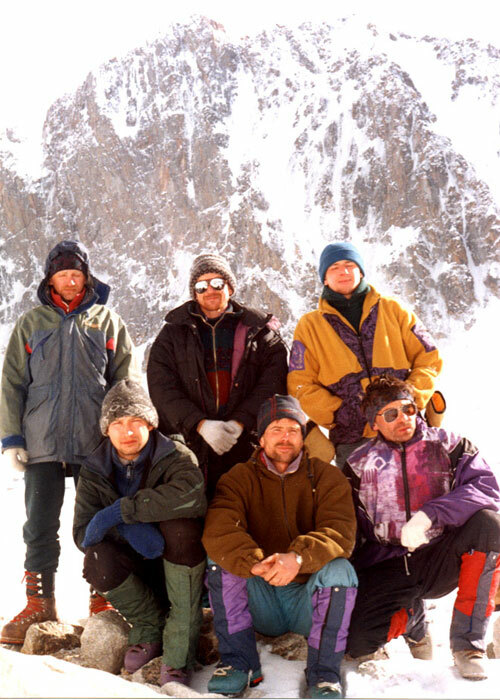 We planned the route as a winter first ascent in 1995. It goes along the left art of the wall between two unrepeated routes Shvab а 82 and Студенина (Studenina) 66. 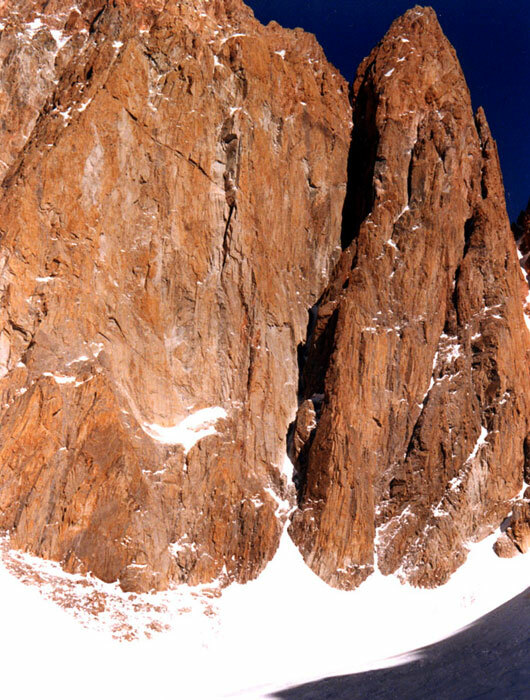 As all the routes on Korea it consists of three parts: icy bottom (50°), then wall part (about 80°) and heavily snow-covered roof leading to the sharp, snow-covered and strongly destroyed ridge with length about 350m. This route is accessible only in winter, in summer it is real stonefalling danger! February 21 we ascended to koron night places, made boot track for the route and in the evening party of two Terentyev - Alexandrov worked out bergshrund in three hours and three ice pitches. February 22 – route continuation. Party of two Zakrep – Stepanov worked ahead. Made 4 pitches (till section № 5). Two vertical rocky levels were especially difficult, (sections 1 - 2, and 3 - 4) 20 meters each. The upper part of the section is an abrupt, about 80°, ice-covered gully-chimney. February 23. At 7 AM the team started ascent in a body. Party of two Terentyev – Cherezov worked ahead, they passed 2 pitches that day (till point 7) third rocky level was especially difficult, (section 6 - 7). Remainder participants lifted and installed a platform under the cornice, in the base of third rocky level. February 24. Party of two Balezin – Alexandrov led. They worked out four pitches of the upper part of the wall and went to the roof, (point 11) The night spent in the same place, in a platform. February 25. Party of two Stepanov - Balezin led. Against our wishes the roof was very difficult, rocks were ice coverd and covered with snow. That day three and a half pitches were passed, 30 meters before the ridge. Ad interim the rest of the team take off the platform and carried it up, to section № 13, and installed it in 2 pitches below the ridge, under the cornice in the base of the abrupt corner. February 26. At 9 AM the team started ascent, at 12 30 reached the ridge, at 14 30 were on the summit. Before the ridge party of two Zakrep – Cherezov were leaders. Three separate parties of two went along the ridge. Descended along the western ridge and Lou route 5 А grade. Along the whole length of the route a leader went on double rope only, the second and the last went along the lines with the belay, and on especially rockfall dangerous sections all the ascenders had an additional belay. Main belay points were made in at least 3 places (nuts, pins or bolts), blocked with local loop, a block was made in the middle of lines. Winter tactics was used in the ascent, in its base were comfortable nights, and working out the route was made from them. 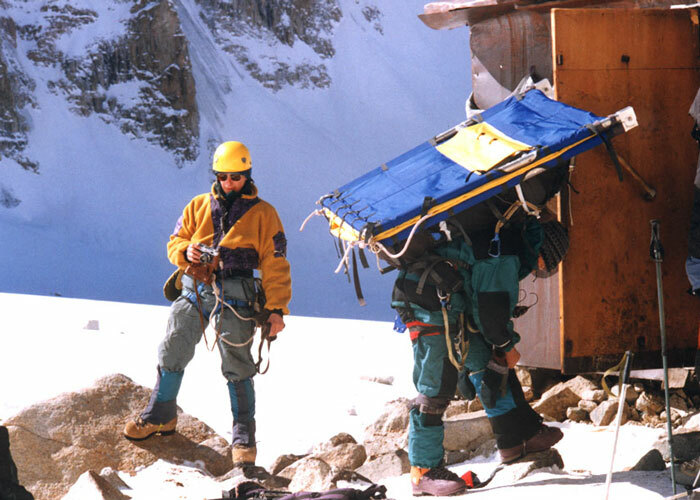 A tent-platform is moved from one safe and convenient place to another while ascending. This tactics allows to improve ascent safety, because party of two can descend along the lines to their tent any time, or to call party of four for help. 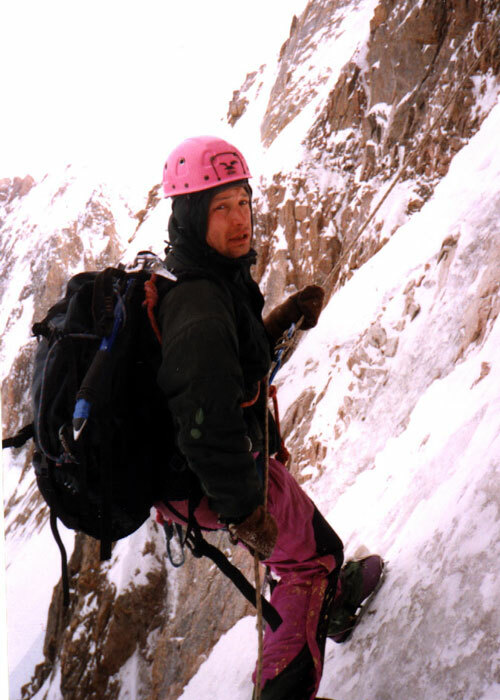 The route has no bivy ledges, so platforms were used. The team used folding, tent-platform for 6 persons, which can be put in two with 2 hinges, that facilitates its tramportation. Diring the ascent a rescue team and observers were staying under the wall: Arhipov V. - MASTER OF SPORTS, and members of another team who returned back: Railko Yu. -candidate to Master of Sports, Karukin I. - candidate to Master of Sports, Obednin К . -MASTER OF SPORTS, Hvostenko О .- I degree. Glazurin Yu. - I degree, and Muravyev V - candidate to Master of Sports, doctor. Radio communication was regular. On the route all modern gear was used. For rock belay nuts were used, pins were placed only when it was impossible to use nuts all the bolts were portable and weren't left on the route. The team had enough fuel and food on the route. There were no fallings, frostbites on the route, in spite of the fact that we continued to ascend in bad weather. Section 0 - 1. 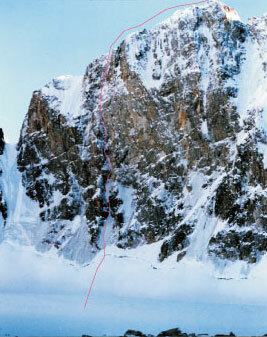 In the base of the section there is a difficult bergshrund, then a wide icy couloir with vertical walls. The couloir narrows in its upper part and connects the first rocky level. On 21.02 - 3 working hours. Section 1 - 2. First rocky level, vertical, sometimes destroyed face. 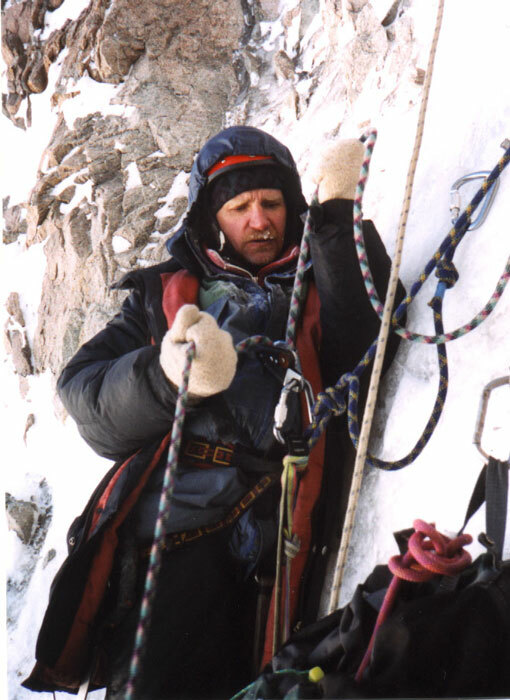 It is passed in the left part, climbing is difficult, mainly by AID. Section 2 - 3. Icy gully - couloir, firstly abrupt (~75°), then it becomes more inclined up to 50°. Section 3 - 4. Second rocky level , the beginning of the route wall part. Vertical face in the gully, difficult climbing, AID. Section 4 - 5. A wide ice-covered chimney. Section 5 - 6. Abrupt gully - couloir, filled with ice. Nights in platform on February 23 - 24 2000. Section 6 - 7. Third rocky level. 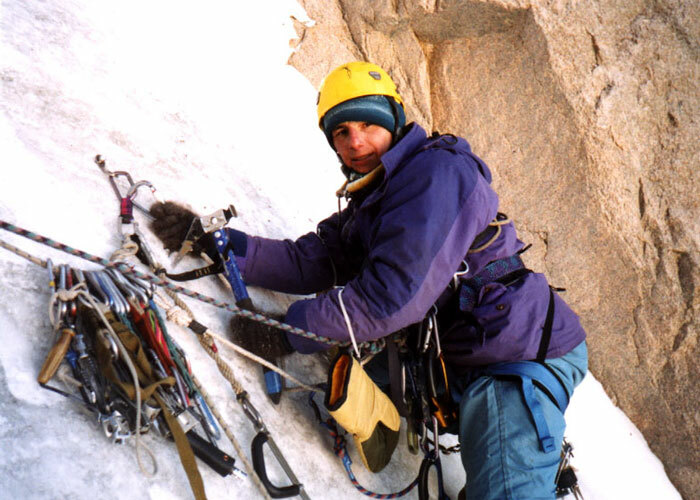 Vertical, sometimes destroyed face, is passed in the left part, climbing is difficult, AID. In the beginning of the section under the overhang a platform was hung. Section 7 - 8. a corner inclined in the right direction, filled with ice. Section 8 - 9 - 10. Big, almost vertical corner, filled with ice . Section 10 - 11. 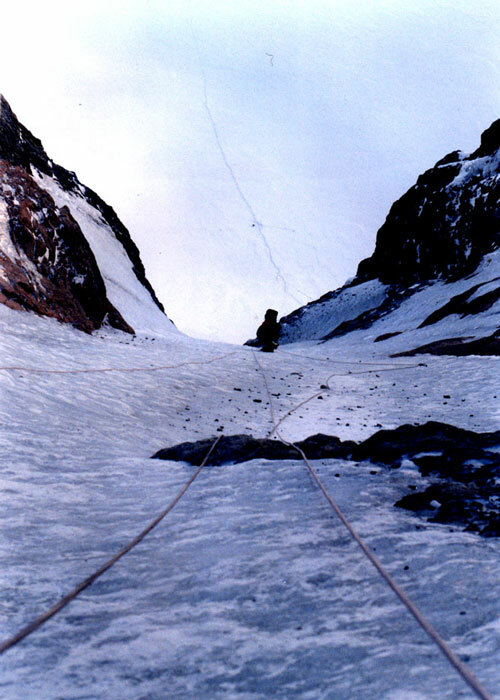 Traverse along the abrupt icy ledge to the right, then a vertical chimney, filled with ice , which leads to the abrupt icy ledge. Beginning of the roof. Section 11 - 12. A series of rocky walls and inclined icy ledges. Section 12 - 13. 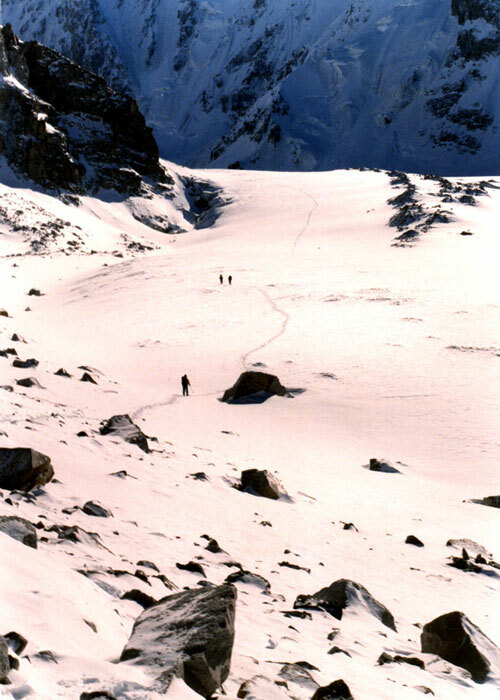 Traverse upwards up to 45° along the icy slabs, the beginning of the big corner. Belay is on bolts. Night in the platform on February 25 2000. Section 13 - 14. Big, abrupt corner with a cornice in the beginning. The cornice is bypassed on the left, climbing is difficult, sometimes with AID. Situated opposite Free Korea . Section 14 - 15. A corner, filled with ice. Section 15 - 16. Snow-covered and destroyed face, leading to the left bypassing the cornice on the ridge. Section 16 - 17. A sharp, snow-covered and destroyed ridge.